There are many different types of mussels around the world. A mussel is much like a clam; it lives in a shell and thrives in salt or fresh water rivers, streams, tidal water, and lakes. 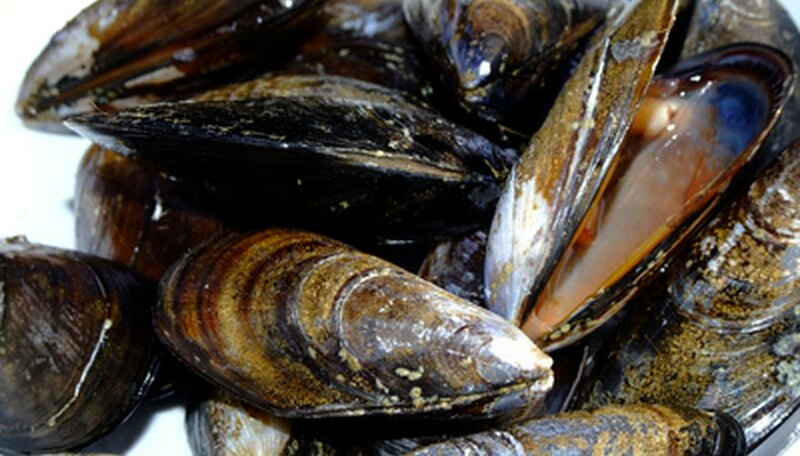 Mussels are also favorite dish among many shellfish lovers as well as a hated pest in lakes and rivers. The zebra mussel is a freshwater mollusk and is found in the lakes and rivers of America. They originated from Poland and the Soviet Union and made their first appearance in America in Lake St. Clair, in 1988. They have a striped pattern on their shell giving them the name zebra. They are small, but some can grow up to 2 inches and live four to five years. The zebra mussel is a pest to lakes due to their prodigious eating of phytoplankton and zooplankton. By doing this, they are starving out other native fish animals that are originally from the area. They produce 300,000 to 1 million eggs per year, but only a small 2 percent live to reach adulthood. The younger mussels freely swim though the rivers and lakes, riding along the water currents from one place to another. The older mussels are stationary, attaching themselves to rocks, boats, pipes, turtles or other mussels. Blue mussels are found around the world in temperate and polar waters. They attach themselves to pilings and rocks along the beach in tidal areas. They’re hard hinged shells vary in color such as blue, purple, and brown. The inside of the shell is pearl-white with a blue or purple lined border around the edges. They grow up to 10 centimeters in length and some can grow up to 20 centimeters, however this is rare. Blue mussels are also known by other names such as bay mussels, farmed mussels and Prince Edward Island (PEI) mussels. The Rabbitsfoot mussel is a freshwater mollusk and gets its name from its shell shape; the shape of a rabbit's foot. Their shells are hinged, thick, rectangular and elongated with a ridges and knobs along the outside. The inside of the shell is white in color and the outside is yellowish brown or an olive color that can grow up to 4 inches in length. The Rabbitsfoot mussel is an endangered species and found in clear running streams such as the Verdigris River. The Snuffbox mussel is a medium sized mussel, only growing up to 2 inches in size. They have a triangular shaped shell that is yellow in color and very thick. Their shells have solid and broken dark green stripes along the width of it and one end is hinged. The Snuffbox mussel is an endangered species and is legally protected. They are found in fast moving rivers with cobble, sand or gravel substrates so that they can bury themselves deep within the sediment of the riverbed. The Horse mussel can grow up to 20 centimeters, much larger than other types of mussels. They live 10 to 25 meters deep in the water; some have been discovered to be as far as 280 meters deep under water. They attach themselves to hard surfaces like rocks, turtles and other mussels. Chasing, Raine. "Types of Mussels." Sciencing, https://sciencing.com/types-mussels-6931267.html. 25 April 2017.